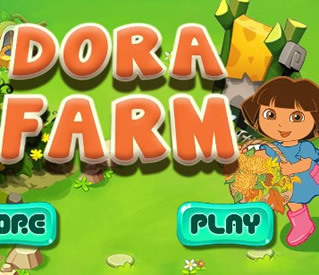 Dora the explorer game, Help Dora save the farm. Interact with the mouse by clicking on the instructions. With this game, you can learn English with Dora the Explorer. Find some farm animals that have been lost in the barn, like a goat or a pig. He discovers the pigs hidden in the mud to take them to his pigsty. Learn farm trades and count animals, go over the numbers with Dora the Explorer. An ideal game for children of approximately 5 or 6 years old. Discover more Farming Games here .